Get Fall Protection Certification Online Now! Workers on sites involving a fall risk absolutely need to be experts at fall protection. Our rigorous fall protection course satisfies the major requirements and regulations set by all the major regulatory bodies. 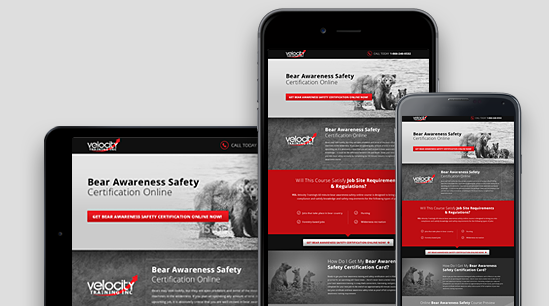 With a convenient, engaging online fall protection course from Velocity Training, you can get the knowledge and certification you need from the comfort of your own home. Will This Course Satisfy CSA, ANSI, CEA, and OH&S Requirements? How Do I Get My Fall Protection Training Certificate? Ready to get your fall protection safety certificate in Alberta or any other province for an upcoming job? Good news — there’s never been a better time to take care of your fall protection safety training in a way that’s convenient, interesting, and gets you ready and CSA / ANSI / CEA / OH&S / OSHA compliant for your next job! At the end of our approximately 3 hour course, you’ll simply print out your certificate as proof of full completion of your fall protection training requirement. What are you waiting for? Take care of your fall protection safety certification quickly and easily with a fun, engaging online course from Velocity Training!